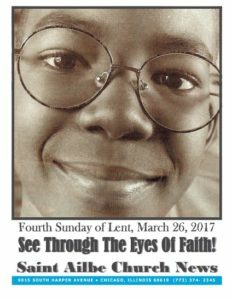 Fourth Sunday of Lent – March 26th, 2017 Can’t you see? Are you blind? Don’t you see? How do you see things? Sight is so critical to our human experience that we find it hard to imagine what it might be like to be born blind. When our eyesight changes or begins to fail, we are thrown into a panic. How will I see? Today’s Gospel is about sight, and what true sight really is. The story details the miracle of Jesus curing the man born blind. As the story continues, we encounter others afflicted by another kind of blindness. They cannot see, or refuse to recognize what is really going on. Without faith, we are blind to life and its real meaning. Do I see myself as I really am? Do I see myself as God sees me? See through the Eyes of Faith!